I’m sure it will pass because it’s not like I don’t have anything to write about. Just yesterday I was cleaning out the fridge when Drew walked in during a tomato situation and averted his eyes while yelling, “Whoa, tomatoes are NOT supposed to be hairy!” See what I mean? Riveting material, people. Then there’s the whole issue with Chuck jumping the shark, Modern Family bringing joy and salvation to my Wednesday nights, playing all my letters in a Scrabble game and finding a delinquent Mother’s Day note from Drew stating, “I love donuts. And my mom.” I understand his priorities. Also on my list, I’ve been running out of ideas for what to write on the notes to the school explaining Samantha’s numerous tardies. (Not that our freakin' awesome new orthodontist in Colorado Springs isn't worth it. Seriously, when is the last time YOUR orthodontist called you over the weekend to see how your daughter was doing after putting braces on her? Or offered to make the next appointment on a Saturday so they could have you over for a BBQ afterward?) (Granted, they probably only do this with their incredibly cool clients.) (I mean, really. Who wouldn't want to have US over for a barbecue? Just because the President won't call us back doesn't mean we aren't totally awesome company.) Anyway, when I suggested to Samantha that we start making a game out of it by writing stuff like, “Sorry Samantha was late, she was smoking marijuana in the basement with her Dad and we didn’t want to rush her,” she responded with, “Are you looking for material to blog about or something?” So I guess that’s a no go. I was also thinking about sharing my thoughts on wind. Aren’t you glad I reconsidered? Seriously though, when Samantha went outside and stood on a rock to see if she could keep her balance in the wind AND IT BLEW HER OFF, that’s when I knew it was time for Chicago to relinquish its “Windy City” title to Denver. My friend thinks I should take advantage of it and go fly kites. I think she should stop telling me what to do. 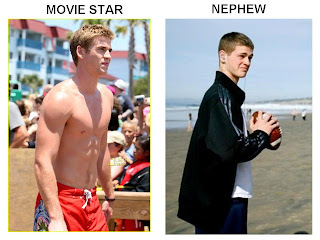 In other news, Samantha and I went to see “Last Song” together a few weeks ago and I can’t stop thinking about how much my nephew looks like Liam Hemsworth. What do you think? I don't think my nephew's girlfriend is going to be very happy about him making out with Miley Cyrus. I also don't think my nephew's girlfriend is going to love me blogging about her. Lucky for her, I don't feel like blogging. We would totally have you over for bbq but the animals would boycott. You could have gone kite flying and attatched Sam to the tail in this last bout of wind. I'm not saying your daughter is skinny, well I am but that's just jelousy talking. We can't even have a straight tree (and by "straight" I mean in a linear, vertical kind of way) in our yard. . . darn "canyon winds". There was a question in the game "Would You Rather" - constant wind blowing in your face, or constant drizzle of rain. I voted wind. Most others voted rain. My rationale? I'd take the breezy winds of the Caribbean over Seattle's weather. Sooo sick of the wind! It is leading to half of my family having bloody noses. BTW~ I actually think that your nephew is the cuter of the two. Those must be some good genes. My friend asked me to guest blog for her once and I didn't have anything to say and didn't feel like it either, so I made up this long rambling story about the origins of cinco de mayo. Her readers were not amused...and I don't think she'll ask me to guest blog again. Score. I love your nonblog. Hairy tomatoes--;o) I chuckle. Damn wind! Nephew is adorable. (deal with it, girl friend) Blog on, or not. 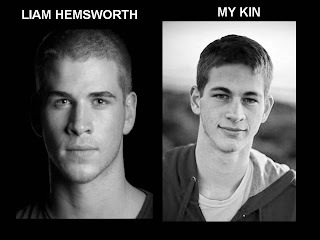 Hmmm... there is a striking resemblance. I'd call you over the weekend and invite you to BBQ- and you wouldn't even have to PAY me! You have paid that man once already, haven't you? There may be a slight feeling of obligation, or maybe you just really ARE. THAT. AWESOME. I love it when you don't blog. Heather: We switched orthos - I've chosen quality over convenience. At least it's a pretty drive! Agreed - the nephew looks a lot like Liam. The wind? It's worse at work (thus, for you) than our house. Hate it. Can you say bad hair day? Your daughter gave me a wave as she walked by my office yesterday. Such a cutie. I think I've seen her more in the last 2 or 3 weeks than I have since I started working there. As if I don't hate going to baseball games as it is, this wind is making me CRazY! I love "Modern Family!" WTF, Why The Face? LOL. Love it, funny part is I was just watching "Dear John" the other Nicolas Sparks movie out, and certain mannerisms that Channing Tatum has started to remind me of Carver. Taryn is right, this is best kept to ourselves.